Your iconic city skyline wraps around in a continuous panorama. Inspired by her love for her hometown, Baltimore native Stephanie Miller created wine glasses etched with the skyline of Charm City as a gift for her wedding party, and a series of city glassware was born. 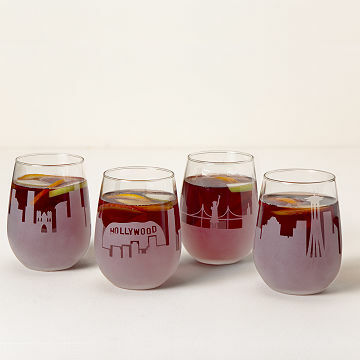 Each stemless glass features an iconic cityscape that wraps around it in a continuous panorama. It makes a great gift for a wine lover, traveler, or anyone who likes to toast to their hometown pride. Made in Reno, Nevada. Also available as a set of 2! Stephanie Miller has always had an artistic knack, but making art wasn't always how she made money. She started her career as a Special Needs educator in Maryland, and after painting a stunning landscape of the Baltimore skyline for a friend's wedding, she realized it was time to pursue her creative dreams. With a lot of help from her husband Josh, and tons of practice, Stephanie found that her true calling was glass etching. Today, she crafts wine glasses with the unique edges of your favorite city, from Atlanta to Seattle. Each elegant design serves up a bit of hometown pride, or toasts to a place close to your heart. Stephanie lives with her husband and son in Germantown, Maryland. Your catalog is wonderful- Unique gifts and fair prices! The glass feels great to hold and the etching looks amazing. I just wish I had bought a pair instead of the individual glass. These glasses are much larger than I expected. They are simply beautiful to display on the shelf and complete my DC themed house. I bought 3 different cities to signify the birth cities of my daughter, her boyfriend, and then the city that they just moved to and bought their first home together. Great for dinner, formal or informal! Purchased this as a gift for someone who's a little homesick, the recipient loves the glass.